Spring in Seattle is full on with flowers blooming and rainbows arcing in the sky. I must tear myself away from this glorious spring to head out for a global adventure. 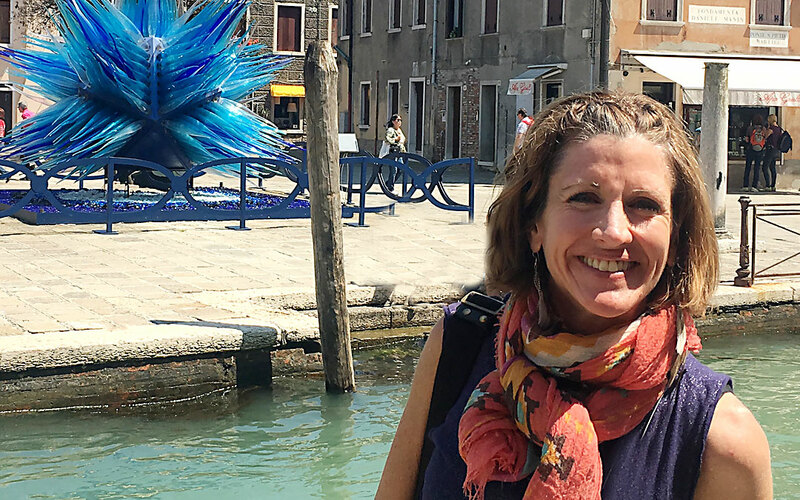 I am so lucky to have had my times as a teacher assistant in Venice for incredible glass maestri, and learn from their centuries of glassmaking and put what they taught me into my own studio practice. At the GAS Conference, Vetro Illuminato the lighted glass show @ Berengo Furnace will include NAVICELLA, an art-glass illuminated pendant made from copper glass with copper metal fins. Navicella- means “the little ship”– my interpretation of the small rocketship for St. Exupery’s Little Prince. For the most part of my artistic career, my success is due to the amazing people who love the work and invest in creating a special illuminated environment in their interior spaces. I could not be more grateful for all of the clients who have become part of the ILLUMINATA family. These past few years I have had the most incredible opportunity to create multiple pieces in custom collections for several home owners seeking the perfect illumination with a flair for art! This is the most special experience for me as an artist/designer. Throughout the creative process from design to execution, I get to know my collectors and make special pieces that have prominent feature placement in their homes and work spaces. Thank you dear fabulous people who support the studio and the works and to allow me to have such a large role in creating the atmosphere in your daily lives. It makes my heart so happy!